Across the Republic of Georgia, science teachers are replacing lectures and memorization with student-centered learning. Student-centered approaches have been shown to increase students’ knowledge of science concepts while also developing the critical-thinking and problem-solving skills that employers seek. The Training Educators for Excellence (TEE) project is promoting this change in teaching practice. The project is a professional development initiative funded by the Millennium Challenge Account – Georgia (MCA-G). TEE is designed to improve student learning outcomes in science, technology, engineering, and math (STEM), English, and geography by providing practical, subject-specific training to over 14,000 public-school teachers in Georgia. Implemented by the National Center for Teacher Professional Development, TEE training is designed with technical support from IREX, which brings more than 20 years of experience supporting teachers in over 90 countries. On a crisp morning in October at Gori Public School #5, 50 miles west of Georgia’s capital Tbilisi, Nana Kavtaradze’s 11th-grade physics students conducted Galileo’s pendulum experiment in groups. Each group developed a hypothesis about how the length of the string, the weight of the bob, and the amplitude would affect the time it takes the pendulum to complete a single oscillation. During the experiment, students recorded their observations, then analyzed and interpreted the data to construct a scientific explanation for the movement of the pendulum. Down the hall, Natia Darakhvelidze’s 6th-grade chemistry classroom was buzzing as students alternated between learning stations in timed intervals to test the pH of common household substances. As the substances turned shades of blue and pink, students analyzed evidence to determine if solutions were acidic, neutral, or basic. Then they shared results with the class to practice communicating scientific information. Both classrooms were filled with noise, energy, and motion. The students were participating in authentic science practice and investigative approaches to learning—ones that placed students at the center of scientific inquiry. The TEE project emphasizes student-centered learning, such as the labs that Nana and Natia now use at Gori Public School #5. 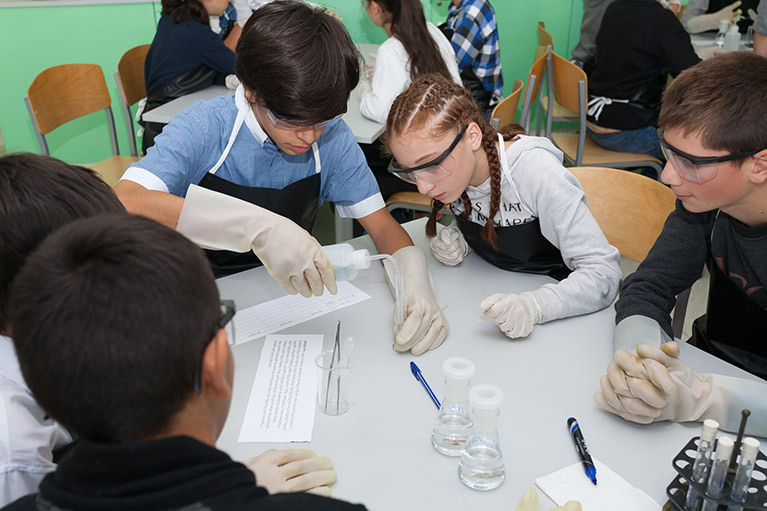 Research shows that student-centered learning, including problem solving and cooperative learning, improves student learning outcomes in science. In addition, socially situated learning that allows students to investigate and explore problems is shown to increase student motivation in science and engineering subjects. “Even though I have been teaching in this school for 40 years, the TEE training changed my practice,” said Nana. “Now, we are passive and the students are active. We have switched to being the facilitators rather than leaders in the classroom,” Natia said. As students, both teachers had experienced a curriculum that was inflexible and classroom environments that emphasized abstract, theoretical concepts. Traditional teaching methods in science limited practical learning to a secondary, illustrative role. Their pre-service training introduced similar pedagogies. Despite almost a 30-year age gap, both teachers used similar, largely lecture-based teaching methods prior to the TEE training. TEE’s professional development model brings about lasting changes in classroom practice by incorporating many effective components that are often missing from at-scale, in-service training programs. These components include subject-specific content, initial face-to-face training followed by ongoing support through professional learning communities, and an associated career ladder for teachers. At the same time, MCA-G is renovating schools and providing new science labs in nearly 100 schools across Georgia, including at Gori Public School #5. Bringing students to the center of the classroom has increased student motivation and engagement in science class. Teachers are noticing these differences as well. Nana and Natia are two of more than 14,000 teachers that have completed the TEE training, and their classrooms are a powerful testament to the student-centered learning that is preparing young people at Georgian secondary schools with the knowledge and skills to successfully pursue higher education and make positive economic contributions in the future. TEE is funded by the Millennium Challenge Account – Georgia and is implemented by the Republic of Georgia’s Ministry of Education and Science through the National Center for Teacher Professional Development (TPDC) with technical support from IREX.